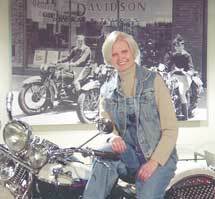 Jean is the granddaughter of Walter Davidson, one of the four founders and the first president of Harley-Davidson. Her father, Gordon Davidson, was Vice President of Manufacturing. Jean began riding a Harley at the age of 12. She was the owner of the largest Harley Davidson dealership in Wisconsin and rubbed shoulders with all the Harley and Davidson family members, famous racers, Hell's Angels and even Evil Knievel. She is the mother of five children and the grandmother of seven grandchildren. She has spent a number of years gathering personal family stories and old photographs to bring you a rare and exciting look into one of the most famous families in motorcycling history. Most of all Jean is a storyteller who loves sharing the stories and experiences of her life as a Davidson through books and public speaking engagements. The adventures she has experienced, both in and out of the motorcycling industry, coupled with her enthusiastic, outgoing personality have captivated thousands of people over the years.